Free crochet pattern for a Christmas Wreath that can be used as a pin or an ornament for your tree or gift packages. It is best to use variegated yarn if using for a tree ornament if your tree is green, because the green yarn doesn't show up very well against green. I've often used the yarn that comes out at Christmas with the red/green/white colors. These sell well at bazaars and craft fairs. The wreath is really green, but the scanner wouldn't pick it up in the right color. If using for an ornament use red, white and green variegated yarn in place of the green as the green does not show up well on the tree. Materials: Very small amount of green worsted weight yarn -less the 1/8 oz. About 3 yards of red worsted weight yarn. Size F Crochet hook. Small plastic ring appoximately 2" in diameter. These can be taken from one gallon milk, water or orange juice jugs that still have them that come off as one piece. Otherwise use the lightest and narrowest carbone ring that you can find. Rnd 1: With Green yarn make a loop on the hook and insert hook in the center of ring. Work 28 sc or as many as it takes to cover the ring. The more the better. Ch 1. Do not turn. Rnd 2: Work 3 sc in each sc around. Join with a sl st in ch 1. End off. With red yarn ch 25. End off. From the back side of wreath pull the red ch between the posts of 2 sc. Now do the same with the other side, pulling between the next one to the left. Tie in a bow. For pin: Attach a very small safety pin on back. For ornament: Attach a hook to the top or make a loop with a sting of yarn. Matierials: For both dishcloth & potholders - 3.5 ozs. 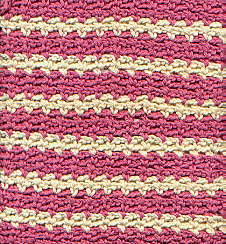 color #46N Rose pink of Lily Sugar'n Cream 4-ply worsted wt. 100% cotton yarn, 2 oz. Ivory #7 Sugar'n Cream Yarn, 2 small plastic rings for hanging potholder. Size G crochet hook or size needed to obtain guage. GUAGE: With G hook, 1 sc + ch 2, 3 times = 2", 7 rows = 2". SIZE: Dishcloth - 9 1/2" x 10", Potholders - 6 1/2" X 5 3/4". Row 1: With rose pink, ch 44, sc in 2nd ch from hook, ch 2, skip 2 ch, sc in next ch, (ch 2, skip 2 ch, sc in next ch) rep across, ch 1, turn (14 ch 2 spaces). Rows 2-3: (Sc in sc, ch 2, skip ch 2 space, sc in next sc) rep across, ch 1, turn. At end of Row 3 change to ivory. Rows 4-5: Rep Row 2. At end of Row 5 change to rose pink. Rows 6-8: With rose pink, rep row 2. At end of row 8 change to ivory. Rows 9-10: With ivory, rep row 2. Rows 11-33: Continue alternating rows 6-10 until 33 rows are completed. End off. Work in all loose ends. Rows 2-3: Repeat Rows 2-3 of dishcloth. Rows 4-10: Rep rows 4-10 of dishcloth. Rows 11-18: Continure alternating rows 6-10 of dishcloth until 18 rows are completed. End off work of first side of potholder. Work in all loose ends. At end of second side of potholder do not end off. Instead, work 1 sl st through both thicknesses of potholder in each st and row around entire pieces. After last st work 3 sl sts through plastic ring. End off. This pattern was created by Barb of Barb's Needlecraft Books.